In the past few months, large-scale protests have erupted across Sudan against the regime of Omar El Bashir. But this time, unlike during the Arab Spring, the front and centre of the protest movement is being held by young, often female artists. And in an age of internet protests, their works are rapidly being shared over social media. 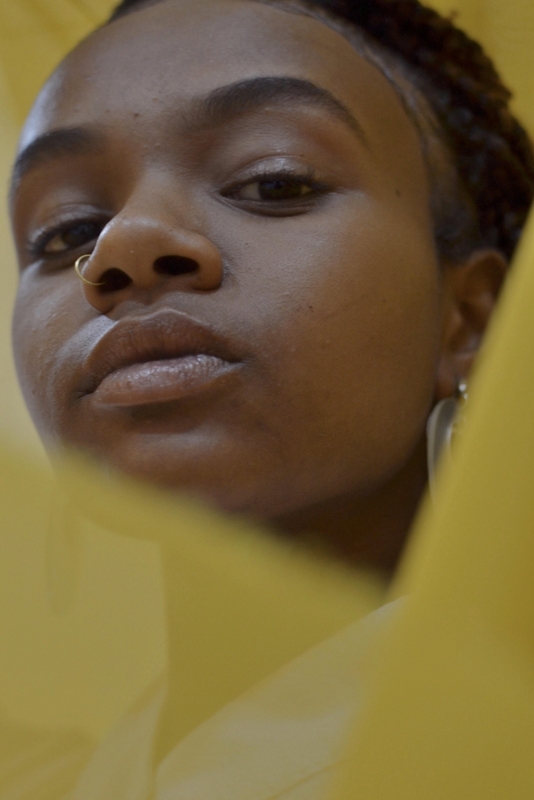 Stockholm-based Sudanese artist Issraa Elkogali Häggström writes about an exciting new spirit that’s coursing through the country, and how she’s being swept up in it. 2019 marks my seventh year in Stockholm, which means that I have lived here as much as I have lived in my birth country. Being Sudanese is as much about inherited identities as it is about longing for a time before my birth when the nation was newly independent and full of promise. As a child of the 80s, all I knew of Sudan was military coups and talk of failed democracies. It is no wonder that I gravitated towards creative outlets with an identity so fragile. In 2010 shortly before I moved to Sweden, I made a short documentary film about the seeds of a hip-hop culture beginning to sprout in Khartoum. I was armed with a handheld camera, my curiosity and a feeling that tides were changing. I dared hope despite the tumultuous political backdrop of the country. I hoped to find a story of hip-hop that would link us to the world outside. Low budget and heartfelt, the film traveled surprisingly well. At spoken mic events and cultural centers young men, for the most part, stood in front of a friendly audience and spit rhymes they had written on their phones. A few had begun creating their own beats, mixing and recording tracks in small private studios around Khartoum. Sudanese rappers like Oddisee were appearing on the international scene but the home-grown talent had not yet developed to export quality. Therefor I was very impressed by the video titled “Sallimik” by the Sudanese comedian and dentist, Maha AJ, that was released late in 2018. High quality footage and styling, original beats and lyrics. This is the real deal! A complete departure from the early days of Khartoum’s hip hop scene. The fact that she is a dentist is delightfully normal also. Many artists pursue traditional professions to appease their families and come into their creative flow only after completing the family-set obligations. MC Mo captured that succinctly in my little hip-hop film when he said “Everybody knows me as MC Mo, but I am just a doctor, a dentist”. In mid December, the government of Sudan announced austerity measures and their budget for the coming year. Outrage at the government’s focus on the military and disregard for the education and health sectors was widespread. The cost of food was also a major catalyst for whole families taking to the streets. School children began protesting the cost of bread and the flame of civil disobedience spread like wildfire. With the violent response from government militias and state security, the people of Sudan began to call for the end of El Bashir’s 30+ years of rule. These grassroots movements were further strengthened by the organised initiatives of a union for Sudanese professionals. The SPA is an umbrella group of unions that began to mobilize nearly 10 years ago. They are currently more respected and accepted than the old-guard political parties. My new heroes are the SPA, doctors and medical students defying the armed militias to treat wounded and maimed civilians, the women’s movements across Sudan, girls throwing back tear gas canisters with home-made gloves and the boys throwing buckets over tear gas to contain the venomous smoke! They have all been beautifully captured in the artwork circulating online. Anonymous picture that appeared on social media during the protests. The young man is wearing a mask to protect himself from teargas and the buckets are used by protesters to cover teargas canisters. Protesters were losing hands trying to throw back the canisters so the buckets appeared shortly afterwards as safer solution. The young man in the picture takes the place of the letter alif at the beginning of the word “Idrāb”, Strike, with the message calling for a strike on March 5. Almost immediately after the protests began, social media platforms were flooded with digital collages, political cartoons and drawings echoing the slogans of the protests. I reached out to a friend of mine who was reposting most of the artwork on her social media, who had written a great piece for OkayAfrica on the movement. Blogger Sara Elhassan is Sudanese American and has a substantial following online. Her blog #45 offers a uniquely bold perspective on aspects of Sudanese culture. Elhassan and I discussed the visible creative push on social media from artists, especially millennials, supporting the call for regime change in Sudan. It is extraordinary not just because it’s the first outpouring of support by creatives across the spectrum of performing and visual arts, but because it appears to be a unanimous call for a new Sudan. 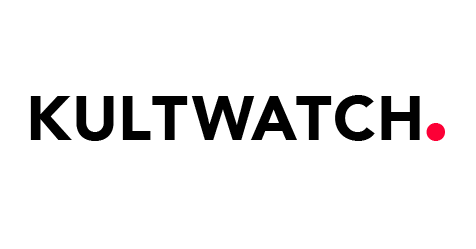 A spontaneous collective rebranding effort, with many even calling for the return of Sudan’s first flag. The Blood Loaf by Abdulrahman Alnazeer (instagram). 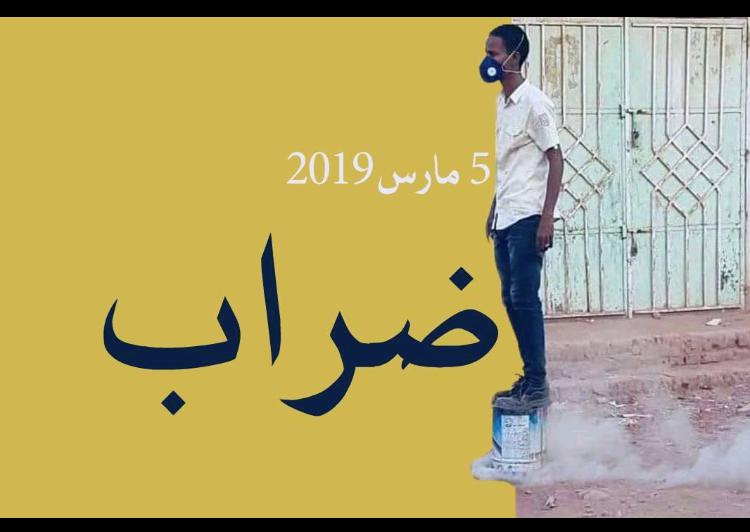 I am curious about the reasons Sudanese creatives are responding so openly to this wave of protests. Elhassan believes that particularly for artists based in Sudan, essentially a police state, creative expression is the safest way to convey a clear message. “Art is the loophole through which artists manage to reflect the reality of what is happening in Sudan and express what the people are feeling. For artists abroad, it is a way to show their support, and to lend their voices to the movement,” she said. Making a statement in work of art or a song allows for civil disobedience without direct confrontation by state security and armed militias. It is also a way to contribute to a wider discourse, thereby adding value and motivation to a movement. 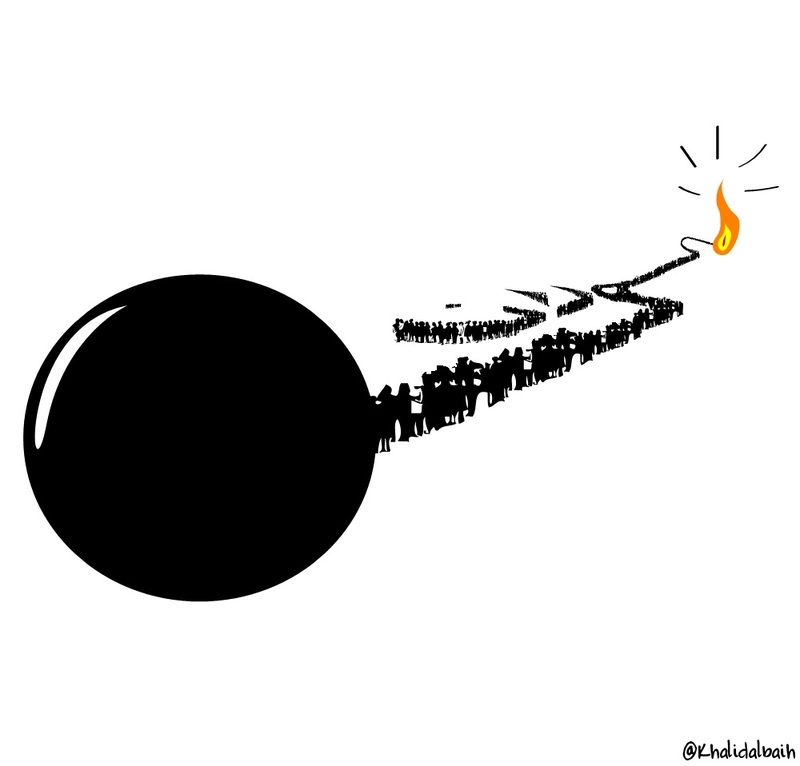 One of Khalid Albaih’s first pieces at the spark of this wave of protests. People queuing for necessities are represented as a bomb with a lit fuse. The show of support, through digital artwork, is different than what I witnessed during the Arab Spring waves of 2011 and 2013. 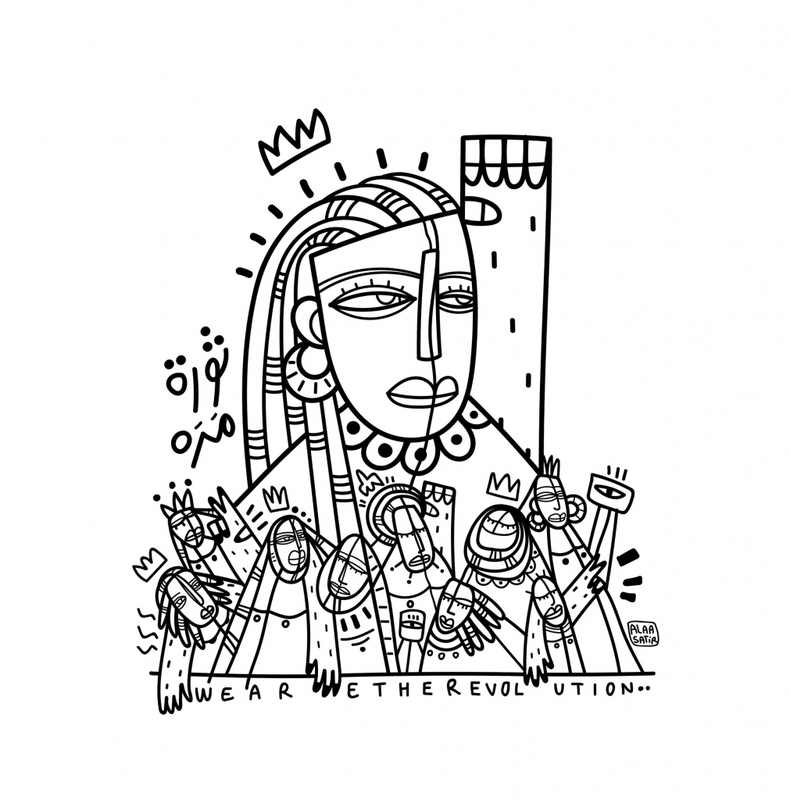 Back then Khartoons, political cartoons by the Sudanese-born artist and curator Khalid Albaih (instagram), were popular with protesters in Egypt, Tunisia and Sudan and were recreated by graffiti artists on Tahrir Square in 2011. Today Albaih, a Soros fellow and visiting artist in Copenhagen, is in good company and has been actively applauding the work of newcomers to the political cartoon. 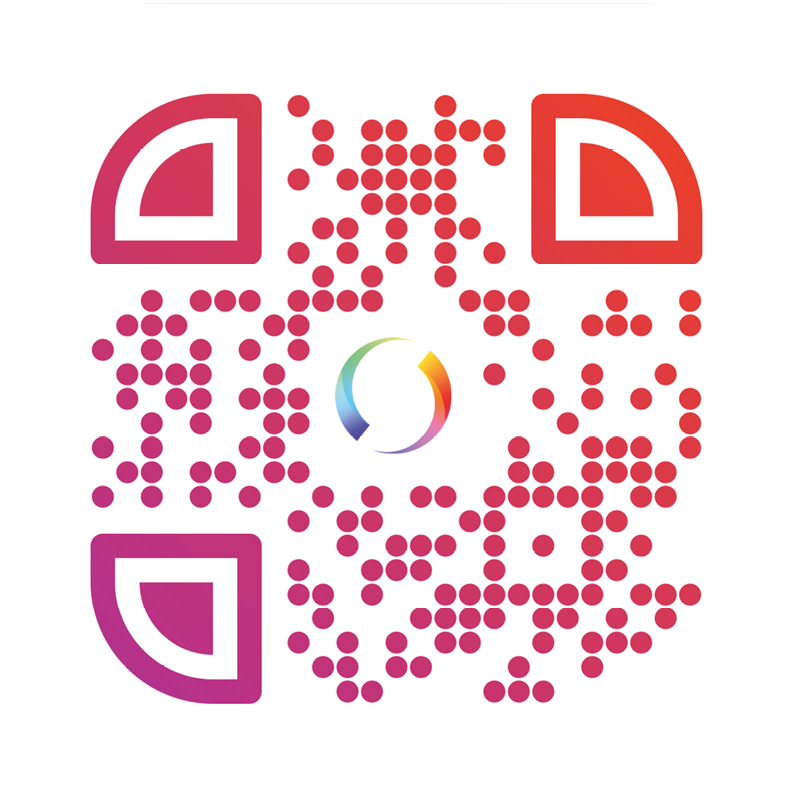 There is not only more creative activity now, it is also branded uniquely with the slogan #Tasgot_Bas, meaning “just fall, that’s all”, thereby standing out from the broader label of the 20-tens “Arab Spring”. Elhassan thinks there are two factors at play that are particular to today’s movement. Firstly, digital art has a larger audience currently because Sudanese people online are more aware of it and there are more artists sharing their work on these platforms. The second factor is a considerable change in how Sudanese people use these online platforms. Elhassan described social media like Twitter and FB as tools for citizen journalism that have now assumed a much more essential role. “They are a logistical and planning tool, a way to disseminate information, and a means to motivate. I think because of this change, the contribution and role of digital art is bigger,” she said. 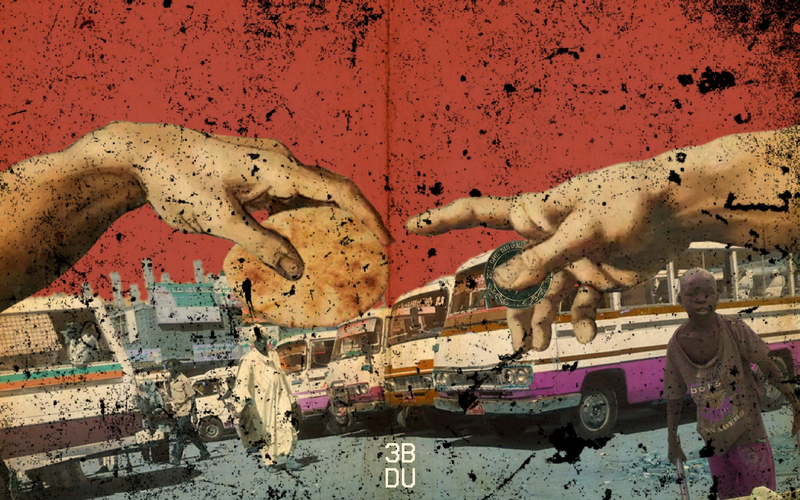 Why does creative expression matter in how we see ourselves, both in Sudan and the diaspora? Elhassan writes that art is a reflection of us both as individuals and as a collective. Sudan, she says, is a country that’s been held hostage for most of its history, the hostage of colonialism and governments that didn’t protect the welfare of the nation. “We have been forced into moulds that do not fit us, our image distorted to the world and, most importantly, to ourselves. Art and creative expression are the ways in which we can reclaim ourselves and our identities. They are the ways for us to honestly and accurately tell our stories,” she writes. And that is precisely why this creativity has struck a chord in my heart. I spent 7 years fighting to pave my way as an artist, working with photography and film in a hostile landscape. The start of my career in Khartoum predates social media. This outpouring of creativity and solidarity awakes a longing in me for marching in camaraderie, but I may have to settle for slogan hoodies and online activism. Historical Women by Enas Satir (instagram). The significance of women in the protests and artwork, reflecting the feminine in Sudan’s political activism, has made a few international headlines. Elhassan is not surprised. In fact she said “it’s about time. Sudanese women have always been at the forefront of movements, for as long as Sudan has been a country, and it is unfortunate that their contribution is underestimated and, more often than not, erased. That’s why I’m grateful for female artists like Yasmin E and Alaa Satir , who I believe have done a great job of highlighting this, reclaiming the space and asserting women’s presence in it”. Her favourite aspects of the representation of the feminine in the work of Alaa Satir, Enas Satir, Dar Al-Naim Mubarak and Instagram’s KandakaKhronicles is that it is undeniable and bold. 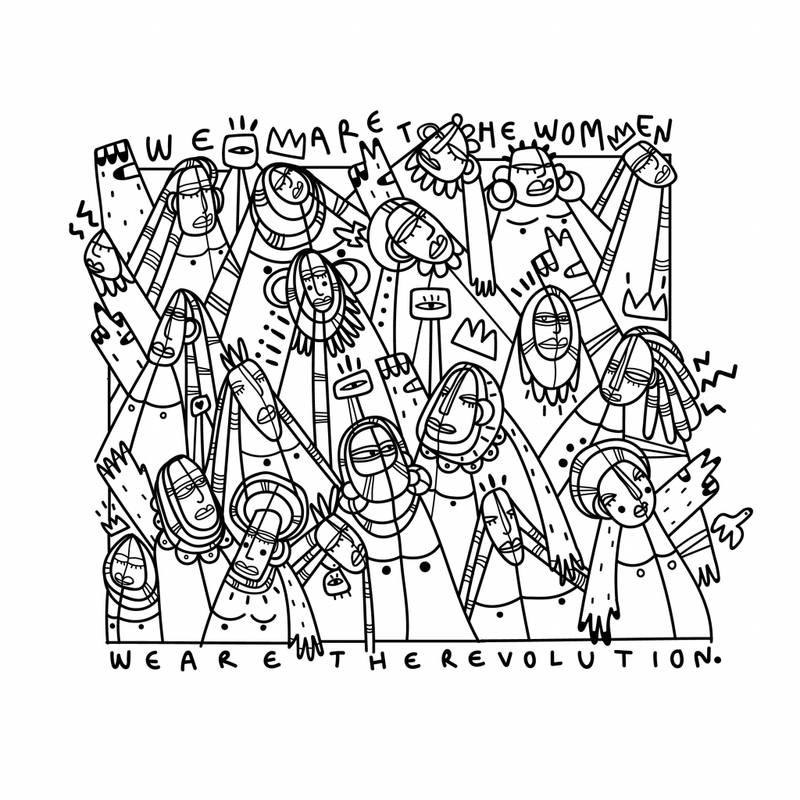 Alaa Satir’s revolutionary women pieces. The signs in the last image read: “Bullets Don’t Kill, Silence Does” and “Freedom, Justice, Peace – People Choose To Revolt”. The graphic designer, illustrator and cartoonist Alaa Satir (instagram) is a graduate of University of Khartoum’s prestigious Architecture program. I happily managed to connect with her online about the force that drives her creativity. Based in Khartoum, her work is usually inspired by social issues Sudanese people face. She tries to shed light on the daily grind with an element of humour, thereby make room for conversations about social change. As for her revolution-themed artworks, she said that illustrating the women’s perspective was key. Her aim is to remind the public of women’s ongoing fight for freedom and equality. Alaa wrote her message in her own words: “We are not here just to overthrow a political regime but the corrupt social system that came along with it, that targeted women and used all techniques to try and push them backwards!” She is truly a source of inspiration and I am left breathless by her strength of character and clarity the messages in her artwork. I am also excited by the collaborations between diaspora artists and repatriated artists. 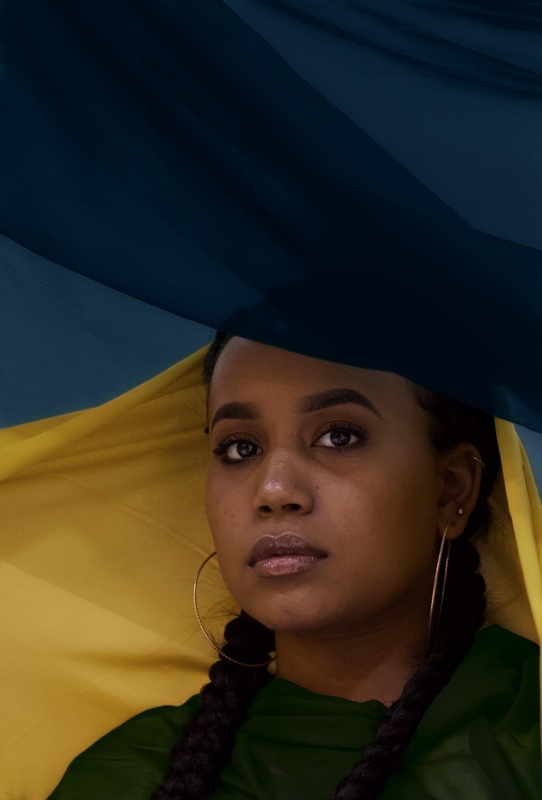 I reached out to a few of these artists on instagram after they posted a series in homage to the first flag of independent Sudan, which featured unifying colours for the tribes of what used to be Africa’s largest country. This Sudanese flag was designed by a young school teacher named Alsireira Makki Alsufi. It was blue, yellow and green, representing the Sahara, Nile River and agricultural lands. Today’s flag was inspired, in 1970, by a political push to brand Sudan as an Arab nation. The Pan-Arab color palette, red, white, black and green, come from the Arab Liberation flag model. 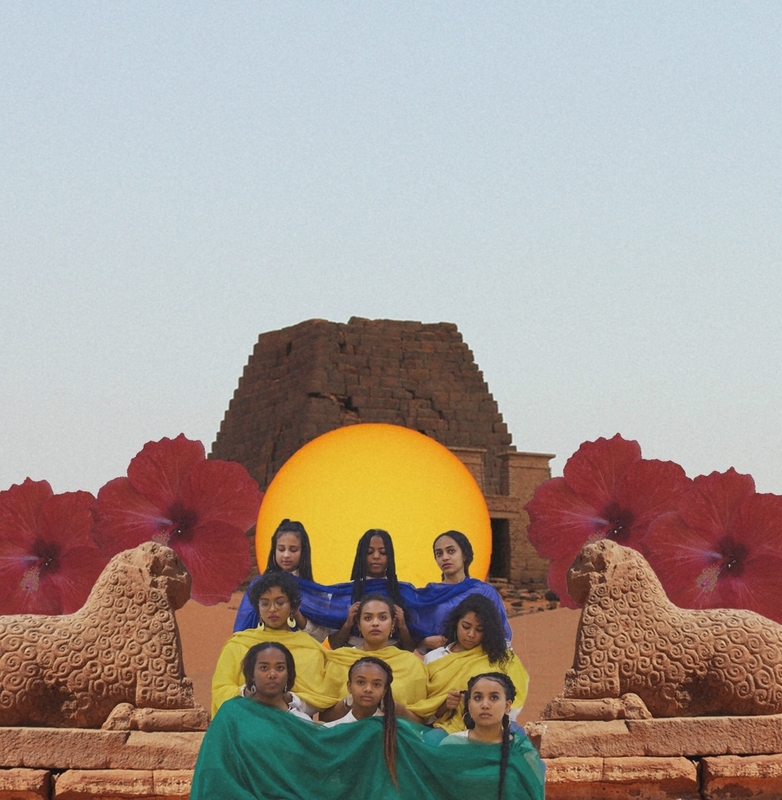 A collage by Nadine El Roubi with ancient Nubian landmarks, the sun, hibiscus flowers and women in traditional Tiab in the colours of the first Sudanese flag. Nadine El Roubi, Rinad Norein and Ranya Sharif are three Sudanese women from different fields who collaborated for the first time on what they called a conceptual shoot. Rinad Norein (instagram) and Ranya Sharif (instagram) are both currently in Khartoum. Norein is a medical student and Sharif is a dental student. Together they started @sd.novice, a duo collective that focused on celebrating Sudanese culture and art. They have shelved the project for the time being to focus on their individual photography. El Roubi (instagram) is now based in Jordan working as a videographer. Their collective love of photography is what brought them together. Their goal was to try and reflect the current revolution. They answered my questions together via email, as a collective, while Nadine was still in Sudan for their collaboration. “We wanted to visually defy the current regime and stand against the violent tactics used against women during this revolution. 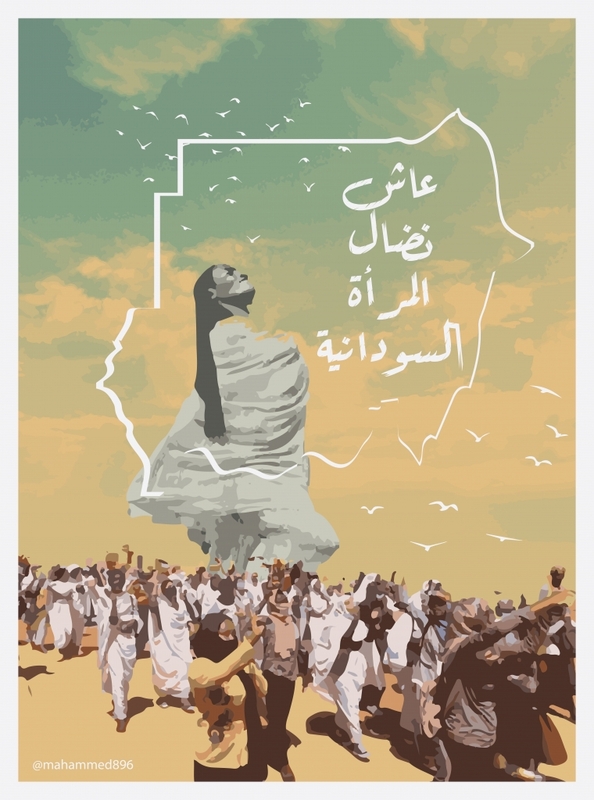 We felt that the power and dignity Sudanese women have demonstrated as the forefront of the protests needed to be further celebrated, as has been done with the work of artists like Alaa Satir,” they wrote. 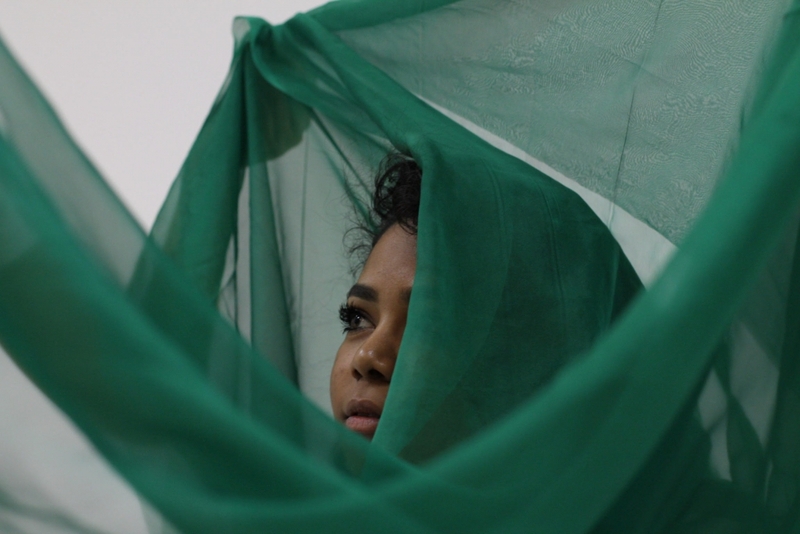 Photos by Ranya Sharif of women in traditional Tiab in the colours of the first Sudanese flag. A photo by Rinad Norein of a woman in traditional Tiab in the colours of the first Sudanese flag. 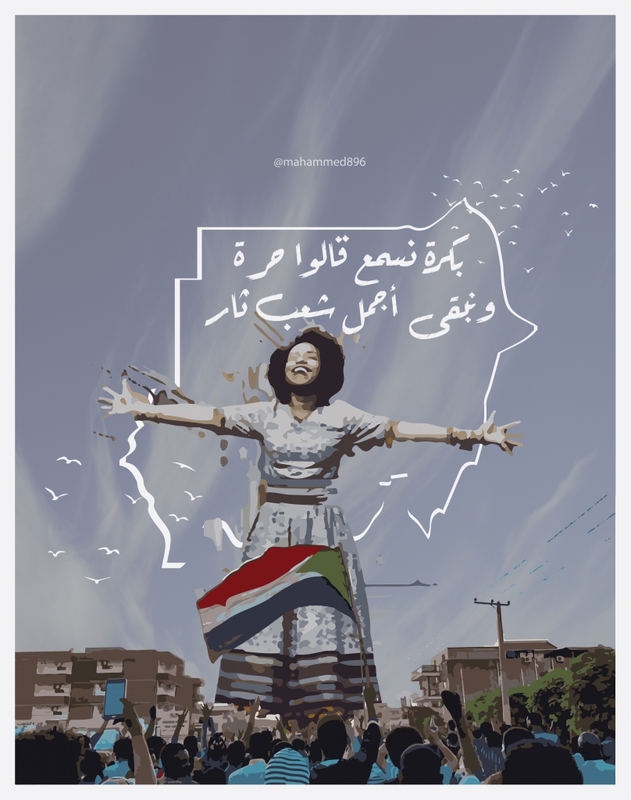 Their aim with this project was contribute, in some small way, to the Sudanese artistic revolution that is rampant online. They share in the belief that all citizens can contribute to the revolution, whether by sharing information online, protesting on the ground, sheltering and providing medical care to protestors, or by creating works of art. There is space for everyone to be involved even in the smallest ways. Rinad and Ranya are serious about continuing to pursue their photography, both individually and collaboratively. Nadine will continue to pursue the arts in film, photography, and music and is always looking to collaborate with artists. I am so pleased to learn of their enthusiasm and dedication. Something is happening in Sudan and it is causing my heart to flutter in my chest. At 23 years of age I began to challenge the social infrastructure by making strides to become a working artist. My goal was to become gainfully employed doing the creative work that I love, in a society that cordons off the arts in a corner and labels it as “hobby”. The sin is in wasting the privilege one’s parents have accorded, ie. higher education. I fought the battles for my liberal arts education and for the opportunity to continue in the performing and visual arts as a graduate student, first in the UK and then the US. That was the sin I committed against my parents’ society. Medical professions, Engineering, Law, Economics or the Sciences are what the nation’s sons and daughters ought to apply themselves to. Generations build nations. What does art contribute? I answered these criticisms calmly, unapologetically and continued with the support of my mother and father to apply myself to a creative career. Art is an expression of the subconscious. Artists reflect and challenge society in one and the same breath. Creativity encourages abstract thought. Abstract thought is necessary for innovation. Innovation is necessary for building nations. I fought the good fight alone at times. Traveling to the farthest reaches of my birth country with a camera, notebooks and coloring pens, to learn about the tribes, the cultures, the plethora of ethnicities and landscapes. My photographs and mixed media artwork were ridiculed and praised all in the same breath. I kept at it for 7 years. With the kindness of good reviews from journalists, mentorship of master printmakers and painters from the college of fine arts my confidence slowly began to grow. I walked the first stretch of road alone only to be joined by these inspirational elders in the latter part of my quest. I won the opportunity to do a project year at Kungliga Konsthögskolan in Stockholm. 15 months in a room of one’s own with enough money to thrive. I was exhausted. The society I left behind had tested me to the very core of my being and the quiet of Skeppsholmen was soothing. So I chose to stay. I decided I would have a new country. This is also my husband’s home country and it felt like the natural choice for me. The days are growing longer each week in Stockholm, and with spring on the horizon this mom of two kids under 5 years of age, is fighting off years of fatigue by looking to her new heroes. They have injected my heart with the fire it needs. My new heroes, the next generation of Sudanese artists and social activists. Young women and men who share a connection with that desert nation, its sweet-water rivers and stunning Red Sea coast, its turbulent political history and oh so promising future. My next challenge is collecting my mind from the cluttered closet of motherhood and coming out to join the creative wave. 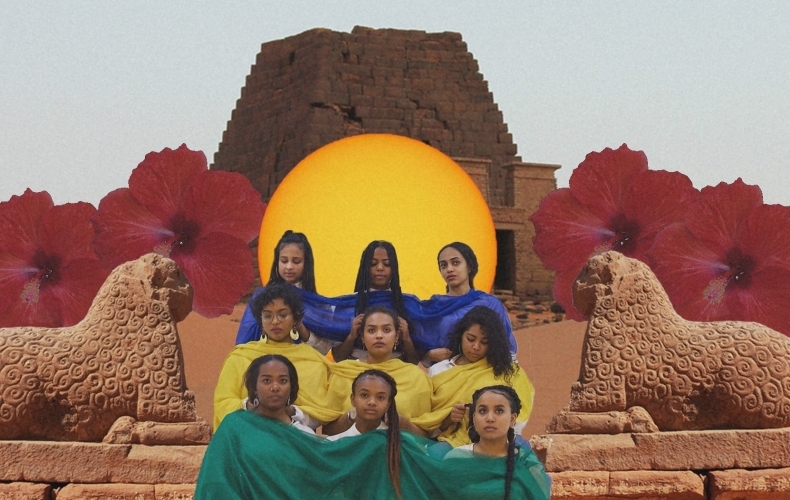 Top image: A collage by Nadine El Roubi with ancient Nubian landmarks, the sun, hibiscus flowers and women in traditional Tiab in the colours of the first Sudanese flag (detail). Issraa Elkogali Häggström (MFA) is the first student from Sudan to attend Kungliga Konsthögskolan. Awarded the prestigious Ibsen Scholarship in 2011 for her installation work titled Nora’s Cloth, her work has been shown in over 14 countries since 2007.